Like most regional cookbooks of the period, rather few of the recipes make any mention of distinctively local ingredients or preparation methods, but there most certainly are some. 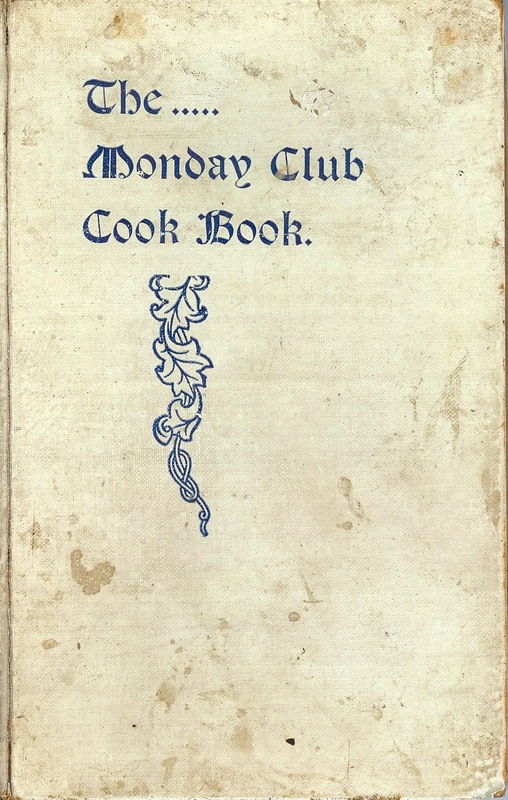 A splendid feature of this copy is the fact that the contributors’ names are included: as published, most recipes are noted as a contribution by “Mrs. K. H.”; however, Mrs. F. P. Kendall went through the book and carefully spelled out the surnames. Now I know that the contributor was Mrs. K. Hobson. Thank you, Mrs. Kendall! Here we have two recipes for Welsh rarebit, one peppery, the other slightly beery. The notable feature here is the specification of “Clatsop cream cheese” in both recipes. Such references in local cookbooks often indicate that the product is advertised in the book, but I did not find reference to it in any of the advertisements. “Cream cheese” here is not the Philadelphia kind, but a reference to a full-cream cheese, probably akin to a cheddar. 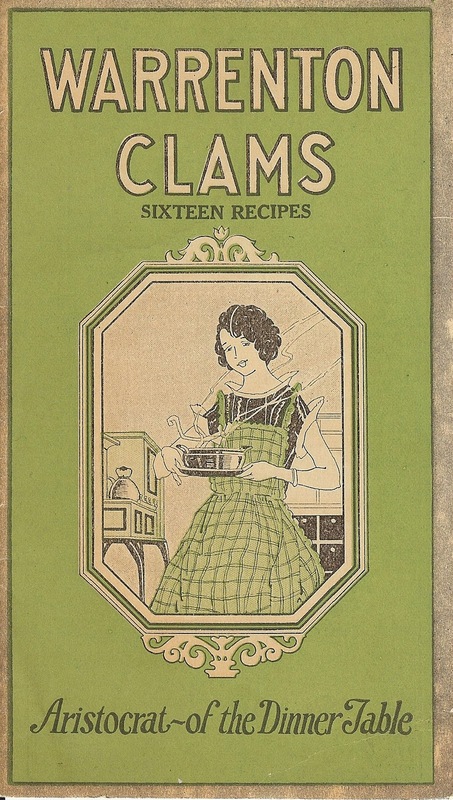 Another local product is canned clams; these are indeed specified in at least one recipe. 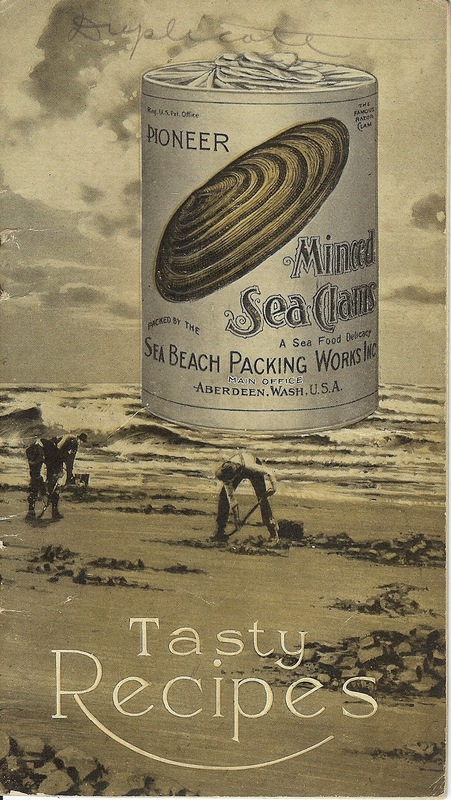 And the cookbook includes an ad for Pioneer Brand minced sea clams, packed at Warrenton by the Sea Beach Pickling Works. 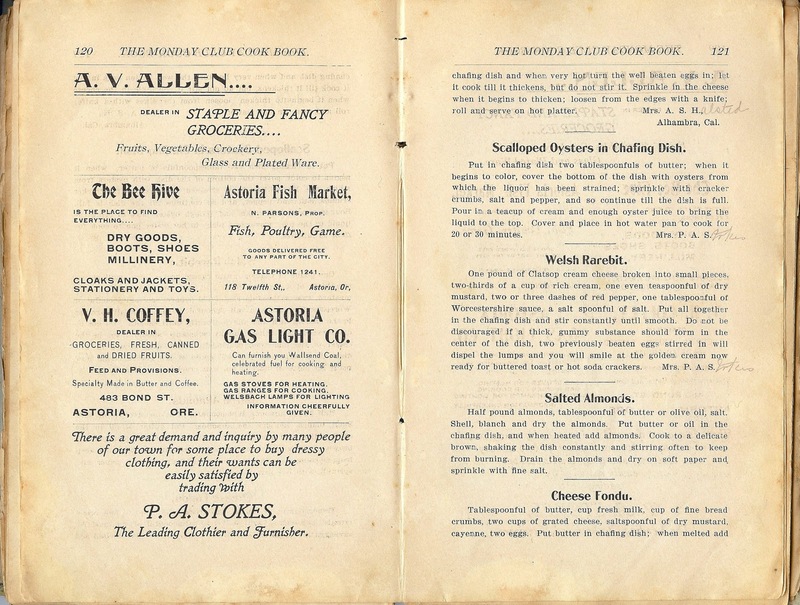 Pictured here is a leaflet from the successor Sea Beach Packing Works, and another from the Warrenton Clam Company. 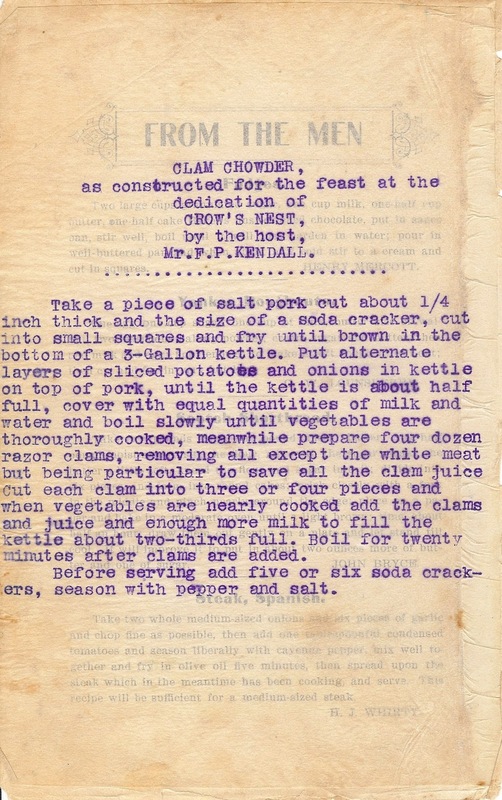 On the other hand, the carbon copy, typed, and tipped-in recipe by Mr. F. P. Kendall for clam chowder calls for fresh clams. 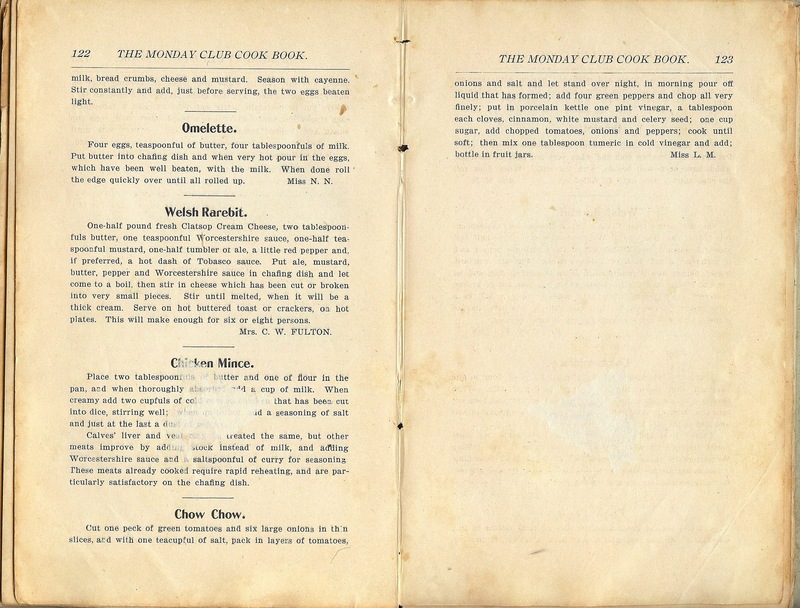 Note that Mrs. Kendall adroitly inserted her husband’s recipe in the special section “From the men”; the heading shows through the thin copy paper of the insert. And who were Mr. and Mrs. F. P. Kendall? Mr. Kendall directed the construction of a fish cannery in Kasilof, Alaska, in 1882, and soon after directed the building of a factory for the California Can Conmpany in Astoria. He was a longtime executive of the American Can Company, and headed the Oregon Fish Commission in the 1920s. John N. Cobb, founder of the University of Washington’s College of Fisheries, called Mr. Kendall “one of the deans of the industry.” In the Cobb photographs collection at the UW (which I once oversaw) is an image of F. P. Kendall with another “dean of the industry,” Astoria cannery operator Marshall J. Kinney. Mrs. Kendall? More research is needed! This entry is respectfully dedicated to Dedie Uunila Taylor, a native Astorian, and her husband, Lonn Taylor, who is an oyster and seafood aficionado.